When my youngest daughter was still in high school, my girls and I often spent the better part of our Saturday mornings during the warmer months at a local farmer’s market. Well, a local market at least. The market located in the parking lot of the Cherry Creek Mall is a bit too chic to really be called a farmers market; it was easier to find perennials, artisan breads, buffalo, local wines and homemade chocolates and pasta than to actually locate a stand that was put up by a real farmer. Still we loved it and would peruse the stalls each week for something fun to eat or put into our garden. One of our favorite food finds was a booth that served Japanese Curry on rice. 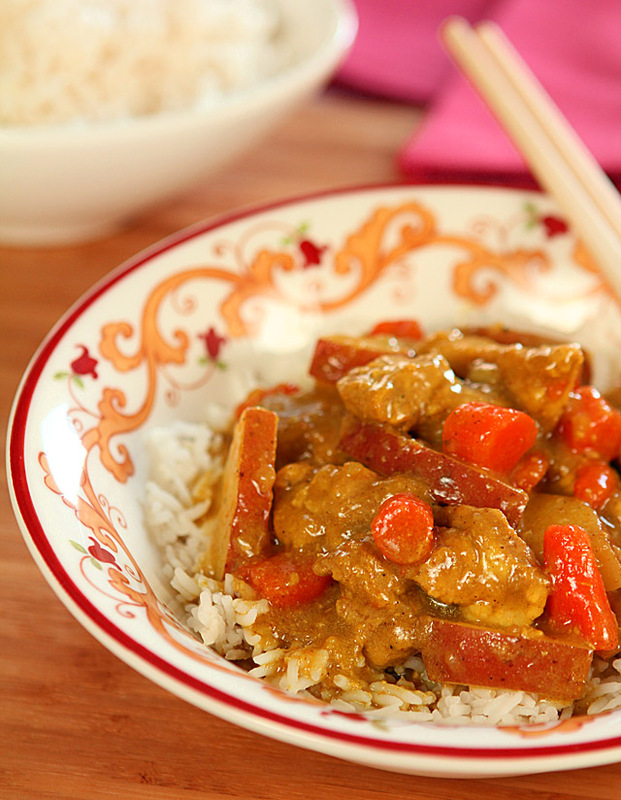 Nothing fancy really, just a scoop of rice ladled with pork, potatoes and carrots in a thick, sweet curry sauce. 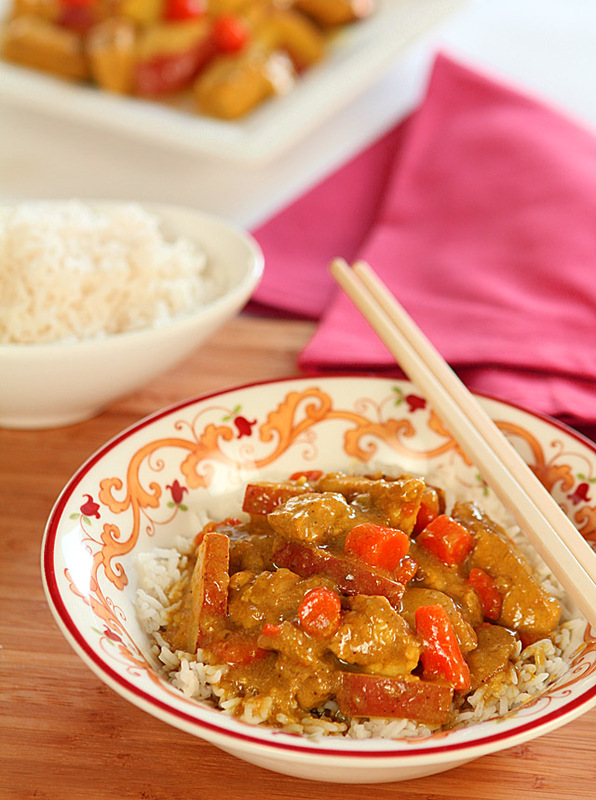 Curry is unmistakably in the dish, but I think less so than in Indian curry dishes. I won’t say we ran straight to that vendor each and every week but it was the one constant during the 6 months of the market that we always enjoyed. Then one year, the fellows who owned that booth weren’t there. After some moments of being totally verklempt I knew it was on me to do some research and recreate the dish at home. Truth is, it was easy to make and even better? It tasted so very much like what we had come to know from our experience at the Cherry Creek Farmers Market. I think we benefited from the get go in that I was able to source a good curry mix at our local Savory Spice Shop. Their Medium Curry and Penzey’s Sweet Curry have both worked well. The truth though is that this is not a very pretty dish and never will be. But it’s good; so good. I’ve served it over Japanese short rice but like it best when I use basmati…that slight nuttiness only adds to the overall flavor. Don’t let this ugly duckling fool you; make this dish! Dice potatoes, carrot, and meat. Slice onions. Sauté onions, carrots, pork and garlic. Add broth, let it simmer for 1 hour until the meat is tender. Skim the broth, add potatoes. In different pan, heat the oil over low heat; add the flour and cook until brown. Remove from heat and add the curry spices. You can find pre-made roux at Asian stores, but this is easy. Add 1/2 cup of the broth to this mixture and stir; it should be like a paste. Adding 1/4 cup at a time, stir the curry roux into the meat and vegetable mixture. Add salt, let it simmer for 30 min or until it thickens. Serve over Japanese short style white rice. « St Croix Libre – The Havana Libre gets Sparkled! You are most welcome…and now I’m craving some too! Japanese curry is the best. My mom has been making it for me for as long as I could remember. It’s even better with some deep fried katsu! Can’t wait to make curry at home – it’s been a while! We just love it…that sort of sweet, sort of spicy type food is my favorite and it’s so easy too. I’m not quite sure why, yet again, notification of this post didn’t make it to my inbox. I’m not sure that the internet gods realize how important it is that great recipes like this reach me. It just so happens I have a lot of basmati rice that needs a purpose. Thanks for doing he research for use and coming up with this recipe. I think a notch has just been removed from my ‘food loving’ badge since I’ve never heard of Japanese curry. Initially, I thought…’wow, what a great fusion’, not realizing this is a common dish in Japan and, well, India ‘is’ in Asia. I’m going to have to try this. Ugly food is usually the best tasting, in my experience, albeit the hardest to photograph. Does that look delicious, I have never had a Japanese curry, what a wonderful meal. It really is Suzanne; I just love it and my friends just devoured it! One of the things I learned to love in Japan was their curry. I can’t wait to try this. As much as I loved it in Tokyo, I’ve never made it at home. I loved the curry at our fave Japanese place back in Missouri, but I’ve never tried to recreate it. This looks just like it! Hmm, think it’s just called Medium Curry; I also use a Lemon Thai based blend for other dishes but both from Savory Spice Shop. Where in Missouri…it’s my home state! I grew up in a suburb of St. Louis. Rolla. We went to college & grad school there. LOL…I went there too. But in a different way. BFF’s brother went to school there; our only attendance was frat parties!